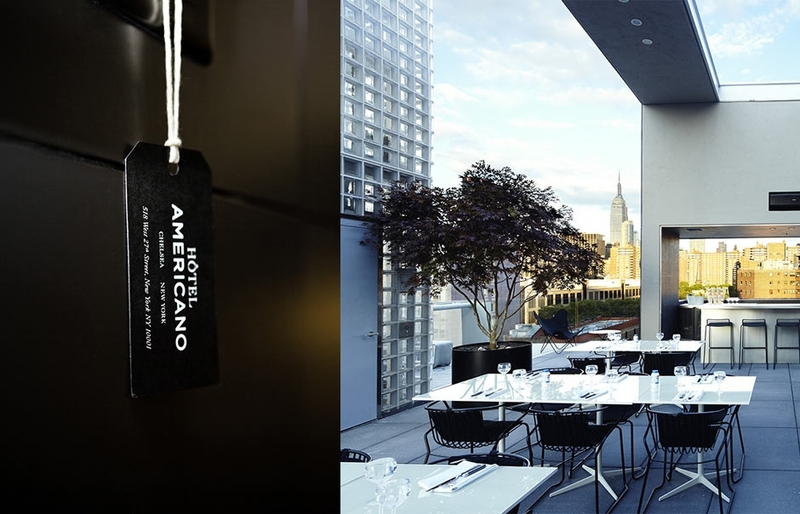 The industrial–modernist architecture of Hôtel Americano reflects spirit of Latin America with a hint of international influences, while the building’s facade of steel mesh blends beautifully with the neighbouring warehouse spaces of NYC’s arts district. The sleek glass structure encased in a stainless steel mesh screen sets the hotel floors back from the street, creating a much needed buffer between the street side hotel rooms and the all night activity of the bars and clubs below. It allows the rooms daylight and views while still permitting them a sense of intimacy and privacy. The clean and quasi-industrial style continues inside—with smooth concrete walls and floors, wood panelling, black and white glass walls and Mid-Century modern furniture. On the ground floor, The Americano restaurant has an entire wall of glass that opens out to a beautiful outdoor patio. Lobby café, which serves coffee and fresh squeezed juice is lively, full of natural light place and a great hangout for guests and locals. A great selling point is the unusually roomy rooftop terrace called La Piscina. It offers a lap pool surrounded by cozy cabanas and daybeds, outdoor dining room and bar with uninterrupted views to the Empire State Building and beyond. La Piscina features not only a seasonal menu but also seasonal decor—open and airy in the summer, glass-enclosed warmth in the winter. An elevator that rises along the north face ferries guests from the lobby all the way to the rooftop, so that visitors can easily hop from one venue to another without bothering hotel occupants. All rooms are low-key rather than luxurious. They are furnished with house wooden platform beds inspired by Japanese ryokans, black vinyl Zanotta bean bag chairs, warm lighting and luxurious natural materials; some come with soaking tubs and fireplaces. Moises Micha, co-owner of grupo habita said; “We want to tell a story about Latin America and New York. A New Yorker is always an Americano, because they live in a city where they have to adapt all the time. 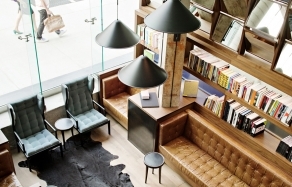 Set in a former parking garage, the Hôtel Americano has a cool industrial Manhattan veneer but a warm Latin soul”. 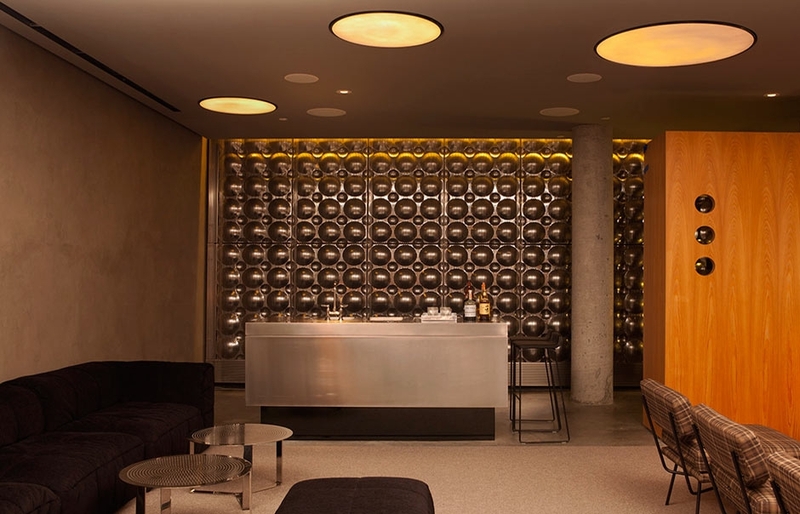 The Hotel is located in West Chelsea, the heart of Manhattan’s art district, close the most active gallery streets by day and vibrant club scenes by night. 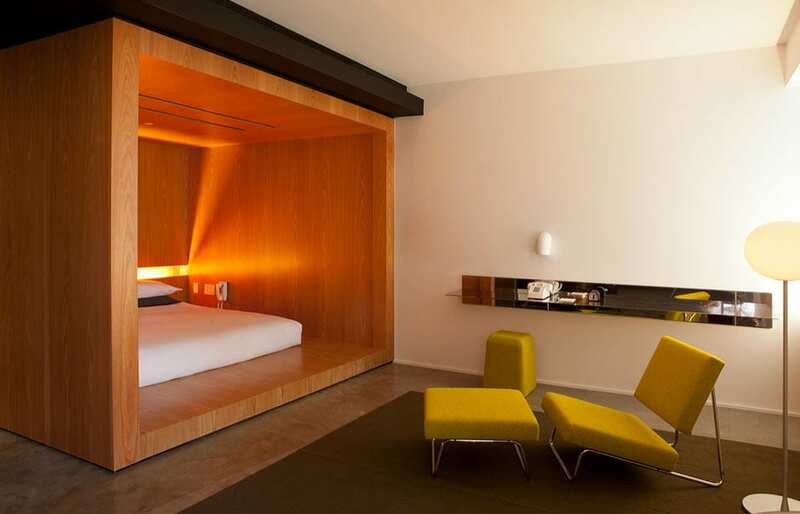 Hôtel Americano is a member of Design Hotels™. Designed for out-of-towners as well as locals, the hotel is becoming a casual hangout for artists, architects, and fashion types (the Elite modelling agency is just next door). If you're looking to feel like you're in the center of the Manhattan scene, this is it. Manhattan-made Bowery Lane Bicycles for guest use: the 11-mile Hudson River Greenway cycle path is one block away and runs all the way down to Battery Park. The nearest subway is about 10 minutes' walk away at 23rd Street (served by B and N trains).